White hair, gray hair . . . badge of honor? White hair and gray hair is just another natural event we can rely on, usually somewhere in our mid to late 30’s as our hair starts cutting off its production of melanin or pigment. Even though most of us can count on it, like death and taxes, few of us are ready for this sign that we are passing into middle age. For me, at 53, I’m not ready to go, “au natural” yet. Maybe it’s vanity or maybe it’s because of my hair background with coloring everyone else’s hair, but never the less, I know someday I’ll be ready to look in the mirror and see white hair or grey hair. Why not, at some time it will be a welcomed new change of look and style. We have a number of options on how to go . . . or not to go gray-haired. If you want to put off the moment of truth, a semi-permanent hair color may do the trick. It can tint your white hair or gray hairs making them look like mini high lights with reddish or golden hues. I did this up until recently, when this formula was no longer covering my increasingly grey hair. Foiling lighter shades of blonde or caramel tones into your natural shade, is an easy way to transition into going gray with your hair. Maintenance is much easier and less costly, which is a big plus for many, as there isn’t that definite line of demarcation as your roots grow in more subtly. I’ve always had dark brown/black hair, a level 4 on the hair color chart. I now use this method of foiling in lighter shades as the dark was becoming too harsh with my changing skin tone. I’ve also lightened my base color by one shade. I’ve got to admit, it was hard for me to go lighter, to be objective about my own hair color becoming too dark. I can definitely see this faux pas on others, but like I’ve always said . . . it’s hard to be objective about ourselves. If you question your hair color choices, ask for advice from good hair colorist you can rely on. (For help check out: Hair Color Experts Advice) There is a natural aesthetic reason why white hair or grey hair appears at a certain point, it softens our skin tones and new wrinkles that inevitably appear. If your hair is an unacceptable color of gray for you . . . you have options. Brighten the gray, lighten the gray, blend or color the gray or . . . not. Some graying hair may retain a hint of color. When naturally red hair turns white, there may remain a slight pinkish undertone. Naturally gold high lights may appear white with yellow undertones. Other natural colors like dark brown or black may retain a silvery tint. Luckily, with today’s long lasting 100% gray hair coverage colors, you can quickly and easily return to the true you – or have fun discovering another color hidden within! Next time you place an order at Amazon take a peek at “Going Gray, Looking Great! by Diana Lewis Jewell,” she’s the guru on the topic. April 13, 2014 By: Barb Quinn Leave your comments (6), Your input matters. You will need bleach with a low level developer to lift color out of your hair before adding a caramel shade. What is the color the stylist should be using for adding caramel colored highlights? Or is it just a bleach mixture that is left on for less time? I have dark brown hair with grey taking over, and we are looking at adding highlights, but I do not want to bleach my hair. I want to make sure that it is being done correctly. I am asian-american. My hair started to show white hair, grey hair roots, and I continued to color my hair. 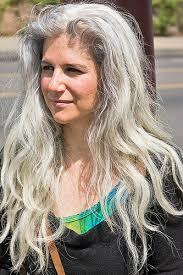 How beautiful and natural grey hair looks. In fact, stunning. I have stopped coloring, and my hair is grey with swirls of white patterns. I changed my dress color palette, and my makeup, and my short grey hair is definitely a eye- turner! As I said, the my guru on the subject is Diana Lewis, who wrote the book “Going Gray, Looking Great”. It would be worth your while to take a peek at this book. She gives good, practicle advice with options. I have 90% gray hair and currently permanently color it black. I want to go natural but unsure as to how to start. I want to DIY. HELP!!! I have always had lots of fine strawberry blonde hair that was completely straight. I am 55 and now most of it is getting quite white hair at my temples and it sticks out in corkscrews. I wear it shoulder length, a carree (square) the French say, no bangs, all the same lenght. I have worn it this way for 20 years. Now it looks bad!